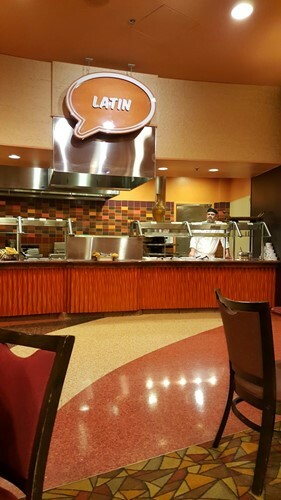 The The Buffet is a restaurant inside Potawatomi Hotel and Casino in Milwaukee, Wisconsin. The food sits out with no one really caring about quality or even stirring it, there wasn't even anyone behind the lines to complain to or ask for anything fresh. I cannot believe how bad it was. My Dad and I sat down to eat lunch at 11:15 and it looked like the food was out for hours already. The food was luke warm at best, no flavor at all. They've made the dessert portions even smaller. Complete waste of money, I'd say skip it unless there is the seafood buffet where the food turns over fast enough that it is fresh. This place is pretty terrible. For starters you have to walk through an insanely smoke filled casino to get to this restaurant. Then once inside the horrible cigarette smell follows you in as there is no walled separation from the smoking section of the casino and the restaurant. The food consist of cold pizza, hard shell "tacos", fried chicken breast cut into three pieces weirdly, cold fishy shrimp, ect. It came out to a little over $60 for two of us (food and soda). To say it wasn't worth the money isn't even fair because I wouldn't eat here again if it was free. Friday night buffet! This is all the crab you can eat. Not split opened, not salty, not soggy, but whole crab legs, that crack just right. The prime rib is delicious, and it's cooked the way you like it. There's such a huge variety of really good food. The staff is very attentive, and friendly. Its a great place to gather with adult family and friends. Note: Children aren't allow. If you get caught in a long line, don't leave, it's worth the wait! Good variety, though not many changes. Some days are better than others. Food quality control could use some help in the seafood portion. The wait times are understandably long on a Friday night but the host staff makes it much worse. Seating staff is incompetent and unprofessional. I patiently waited in line 30 minutes and then 10 minutes at the front of the line after I paid. I was then asked to sit down to "wait for my silverware" as I watched other people behind me be seated. At 10 minutes to closing time, I overhead the seating staff informing incoming guests that the buffet would be closing at 9 pm. Upon making my displeasure known, an visibly annoyed hostess immediately called a manager to "deal" with me instead of apologizing or promptly seating me. Not worth the money. Food is mediocre and service is not great. Go to Golden Coral. They're open until 10. Everything would have great, but the catfish was over salted. The blackeyed peas were also too salty. Plain corn bread muffins would be great. I have been wanting to try The Buffet at Potowatomi for years now, and finally had a chance to on 08/25/17! We went for the All You Can Eat Crab Legs as that is one of my all-time favorite things in the world, and I was in heaven! I could have sat and eaten a ton of those crab legs, but my friends aren't really into that sort of thing and I also wanted to try other offerings from the buffet. Overall I would say that everything was very good! I will definitely be back as soon as possible for another go at the AYCE Crab Legs!